Eddie Cunningham, who served as Cannon County's offensive coordinator and head baseball coach, has left the program to accept a position as assistant football coach at Riverdale High School. Cunningham joined Head Coach Joel Schrenk's staff as an assistant coach in 2009 and was elevated to offensive coordinator for the 2011 season. He served as the school's head baseball coach for each of the previous two seasons. 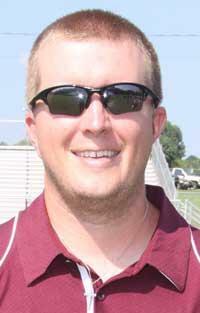 Cunningham will coach outside linebackers at Riverdale. He will not coach baseball for the Warriors. Though the timing is tough, one week into the start of preseason football practice, Cunningham said the opportunity was too good to pass up. "It's one of those things where if I take advantage of (this opportunity) it could open a lot of doors for me," Cunningham said. "The tradition is awesome (at Riverdale). When you walk in the door you see four state championship trophies and multiple Mr. Football Award winners, just all the tradition here." The loss leaves Cannon County searching for a social studies teacher, a football coach and a baseball coach with the start of school on the horizon. "The timing is bad for us but the move is very good for (Cunningham)," Schrenk said. "(Cunningham) and I had talked several times about his future. He has a new daughter and he wants to spend more time with his family and be closer to them. He is going to be part of the one of the premier programs in the state, and I am very happy for him." Cunningham coached quarterbacks for the Lions. Schrenk has taken over that responsibility and T.J. Daniel has shifted to coaching running backs. Schrenk will also serve as the offensive and defensive coordinator in 2011. "We need to have somebody hired for school next week, if possible," Schrenk said. "If this happens in May then I am able to find a System guy and get someone in here and it's a smooth transition. At this point, this late, we are really looking more for a position coach." Cunningham said he looks forward to following the progress of the Cannon County players he coached, as well as the development of the program. He said the opportunity at Cannon County helped lay the groundwork for his move to Riverdale. "I love those kids and learned so much from coach Schrenk," Cunningham said. "(Schrenk) gave me a chance and in the short amount of time I was there he entrusted me to do a lot more things than past coaches had. I was able to learn from coach Schrenk. I tried to do the best job I could, not only teaching the young men football, but also helping them in the classroom and giving them a friend as a coach and a teacher. I will never be able to replace those two years." You wil be missed, Good luck. You will be missed by my son. He always wanted me to meet you. You were not only a teacher you were a good friend to him. We wish you will with your new job. Certainly hate to see you leave Woodbury! But happy for you and your family! Best of luck and keep in touch! Hate to see you leave the school. We wish you great luck!